The strip here is from the 1952 Hwyl! annual - I found the scan on the Bear Alley blog. I don't know much about this guy, but either he's a hero, or he's been driven mad by the banality of Radio Wales and attempted to murder someone while under the influence. It's anyone's guess. Gareth Thomas - aka Red Dragon - is part of Marvel's SHE (Superheroes of Europe) lineup. There is also a briefly seen Lady Red Dragon, but that's about all Google could tell me. Stinger - aka Blodwen Reese - is a member of the Marvel Genetix group. According to her Marvel bio, she was abducted as a young girl by a mad geneticist who helped her gain the ability to absorb energy, then shoot it from her hands. It doesn't mention where she learned her gravity defying latex wrap skills. Wikipedia tells us all we need to know when it states, "Captain Beany [from Planet Beanus] is a Welsh eccentric and fundraiser." His council flat in Port Talbot also serves as the Baked Bean Museum of Excellence. That's commitment. You can keep up to date with all the latest news at www.captainbeany.com. Scorch (and his younger incarnation Scorch Bach) is a 'superhero dragon' and mascot of the WRU (Welsh Rugby Union). He features in his own series of online bilingual comics, and in a published graphic novel. Anthony argued strongly against Dan Can's inclusion but, he's a superhero and he's Welsh. As we've just seen, there was nothing in the challenge that said these superheroes had to be humanoid, after all. 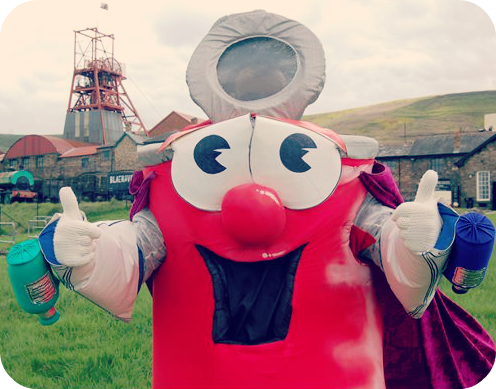 Dan is Torfaen's recycling mascot - because if Dan Can, You Can. (Geddit?) He has lots of different comic strips and other resources which you can check out HERE. Real name, Huw Gruffydd. He was a member of the Captain Britain Corps, appearing in one issue of X-Men: Chaos Engine before being killed off by Doctor Doom. What a guy. Morwen Powell is the Captain Britain of an alternate timeline where Wales was the preeminent culture of the British Isles. Marvel always likes to keep things believable. Marvel character Megan Gwynn is a troubled teen from a (fictional) former mining town called Abergylid. Instead of filling diaries with tortured metalcore lyrics, Megan discovers she is actually a mutant with the ability to fly and, later, perform magic. She still comes out with lines like "there's a sliver of darkness that Magik put inside my soul" though, so the potential remains. SuperTed started life as the titular character of a book series by Mike Young. Young founded Siriol Productions in 1982 to take Ted to the television screen, with the show first airing on S4C in 1983. A defective teddy bear, discarded by a toy factory, Ted gets a whole new lease of life when he's discovered by an alien from the Planet Spot - together they fight crime and strangely effeminate skeletons. There has been speculation that Ted is shaping up for a reboot so, though you snigger, he could be the best known Welsh superhero for a long time to come! That's a pretty good list! I've never heard of any of them. Cheers! Yeah, it took some work to get to ten! Who knew?? I loved Super Ted when I was little! I personally think Jeff from Coupling should count as a Welsh superhero! Thanks so much for linking with #FridayFrolics. Hope to see you next week! A great read! I think superted might have been the first show on S4C if i'm not mistaken?